Taste the Tradition. There is nothing better than freshly collected fruits and vegetables. When you gather them from the trees and you taste them right away. It feels as you taste the full flavor, like the fruit is still alive. You may find good products at the supermarket but sometimes they could be tasteless. Since in the industrial production sometimes the producers pay more attention to the look and the resistance of the fruit, not its taste and nutritive value. That’s why it is definitely best to have someone that could provide you with fruits and vegetables or even better, to have a chance to collect your fruits by your own. Hanna, together with her friends and family, has just arrived at her grandfather Anton’s farm. They would like to collect the fruits that grow on the farm and prepare some interesting traditional recipe. They have chosen Potato soup for today but first they need to find all ingredients needed for making this recipe. Potato, carrots, onion, celery, salt, pepper, are the main ingredients needed for making this tasty soup while the other things are a personal choice of the one that prepares the soup. Let’s help Hanna and her friends and family collect the necessary vegetables first and see how they would prepare the soup later. 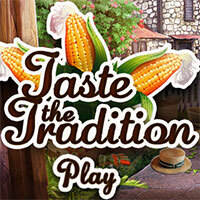 Taste the Tradition is a free online hidden object game on Hidden4Fun.